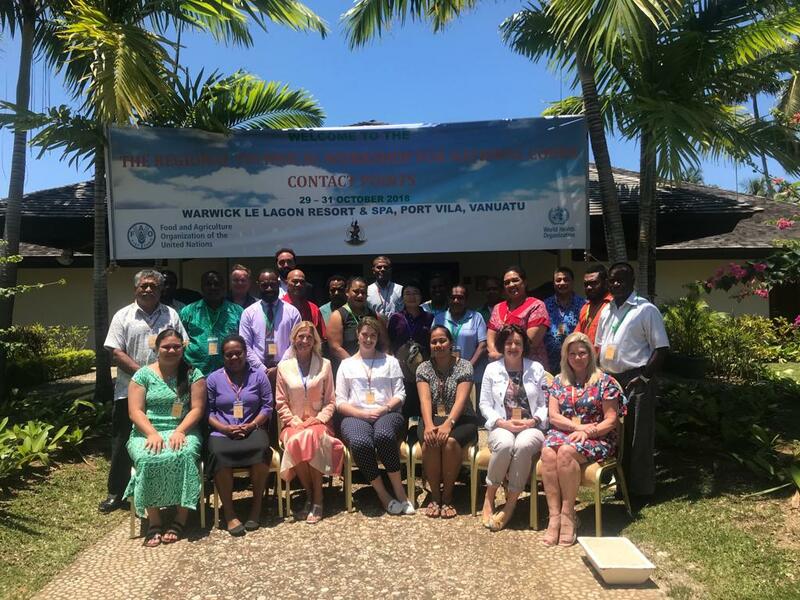 Twenty representatives from Codex Contact Points (CCP) in the North America and Southwest Pacific region met in Port Vila, Vanuatu on 28-30 October 2018 for a workshop on the online systems that are an essential part of contributing to Codex standard-setting. Participants also came together to discuss regional input to the Codex Strategic Plan 2020-2025 and to continue work on two regional Codex standards, for noni juice and kava, both local beverages. The countries present were Australia, Cook Islands, Federated States of Micronesia, Fiji, Kiribati, New Zealand, Papua New Guinea, Samoa, Solomon Islands, Tonga and Vanuatu (the hosts). In welcoming participants, Viran Tovu, the CCP of Vanuatu, underlined the relevance and importance of this type of training that was taking place for the first time in the region. Senior Food Safety Officer of the Codex Secretariat, Hilde Kruse, reminded the participants how food safety concerns everyone as foodborne disease has an impact on livelihoods, the economy and societies at large, especially children. “We work together in Codex to ensure imported food is safe and that countries can gain market access,” she said. By working together across sectors and regions it will be possible to achieve the United Nations Sustainable Development Goals regarding food safety which means fighting hunger and ensuring food security, the meeting heard. Tsogzolmaa Bayandorj from the WHO Vanuatu Country Office told participants that working together in the region can contribute to improving health – preventing non-communicable diseases and malnutrition as well as boosting food safety and food security. Timothy Tumukon, speaking on behalf of the Minister of Agriculture for Vanuatu and the office of the Director General for Biosecurity, welcomed participants. “It is an honour to be recognized as part of the Codex family, to learn and partake in Codex activities,” he said. He explained that there are limited resources and opportunities for the small island states in the region to participate and so by building the skills and knowledge to use Codex web tools, more countries can expect to take a direct part in food standard development. The discussions on the Codex Strategic Plan were an excellent chance for the region to engage on matters ranging from climate change to food labelling, food imports and national capacity across sectors regarding the dynamics of Codex work. Setting priorities and defining regional objectives is a vital part of participating effectively in Codex.